Astonishingly perhaps, most of China’s computer infrastructure is still running Windows XP, nearly 5 years after all support from Microsoft ended, rendering it more and more open to attack. 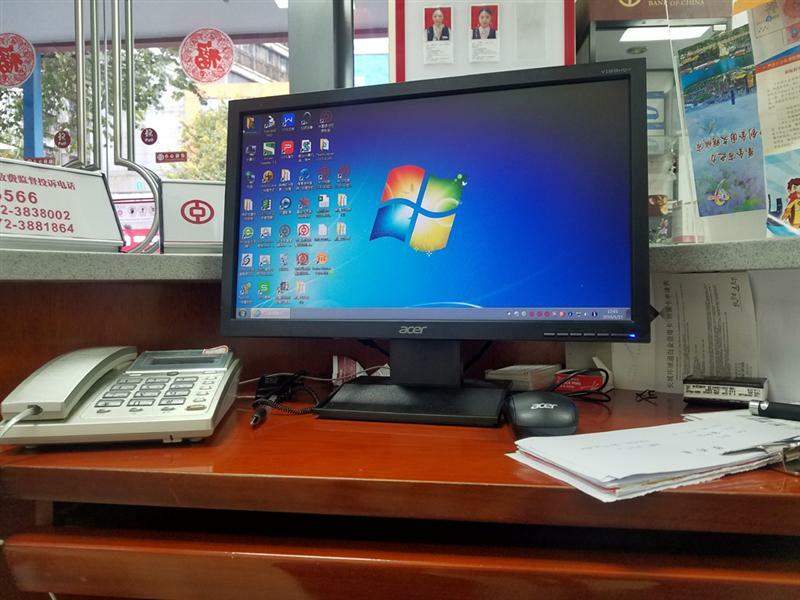 The above picture was taken in a Liuzhou branch of the Bank of China, just days ago. Most ATMs are still using XP as are many branches of the local government, the railway system and airlines. A couple of years ago, I asked a young friend how often he updated his anti-virus software. He responded that he might once a year or so. He couldn’t understand why I suggested he did so at least once a day! But the prize goes to the donkey who told me a computer couldn’t have viruses because it wasn’t connected to the internet. b) not being connected would only mean the virus database wasn’t being updated. Oh, by the way, he was a professor in the IT department of a local university. While China has adopted the internet enthusiastically, it remains astonishingly naive about security.
. This entry was posted on Saturday, January 19th, 2019 at 9:04 pm	and is filed under Chinese Banks (Grrr! ), Computer Stuff, Stupidity. You can follow any responses to this entry through the RSS 2.0 feed. Both comments and pings are currently closed.